Lift partnered with the CineGlobe Film Festival at CERN and the Tribeca Film Institute to help them promote their “Story Matter” Hackathon, which took place March 15-19 2014 at CERN. To get the word out about the upcoming Hackathon Blabdroids invaded Lift. 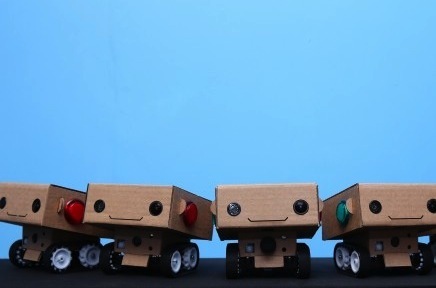 These adorable robots, created by artist and roboticist Alex Reben for his master’s thesis at MIT, filmed interviews of participants and ask them personal questions, voiced by a 7-year-old boy. The Story Matter Hackathon was a great success. It brought together people from the worlds of media, film and science to Switzerland for a five-day hack focusing on scientific storytelling (take a glimpse at what went on in the video below). People traveled from as far as Brazil, France and Portugal to be a part of it, with the 43 participants being split into teams to create projects. The hack wrapped up with a presentation of the works at CERN's renowned Globe in front of an audience of 150 people. The blabdroid presence blended perfectly in an ongoing series of events and workshops Lift has been producing, exploring the relationship between robots and humans: After the Robolift Conference in 2011 and bringing the mind-controlled robot of José del R. Millán's laboratory at EPFL to Seoul in 2012 for the Swiss-Korean Innovation Night, at Lift13 Kate Darling (MIT Medialab / Harvard) and Hannes Gassert’s workshop “Harming and protecting robots – Can we, should we ?” stirred up a lot of discussions and was widely covered in several conferences and articles throughout 2013. It investigated the same phenomenon as the Blabdroids projects: how humans tend to anthropomorphize robots and computers and thus engage emotionally engage with them.